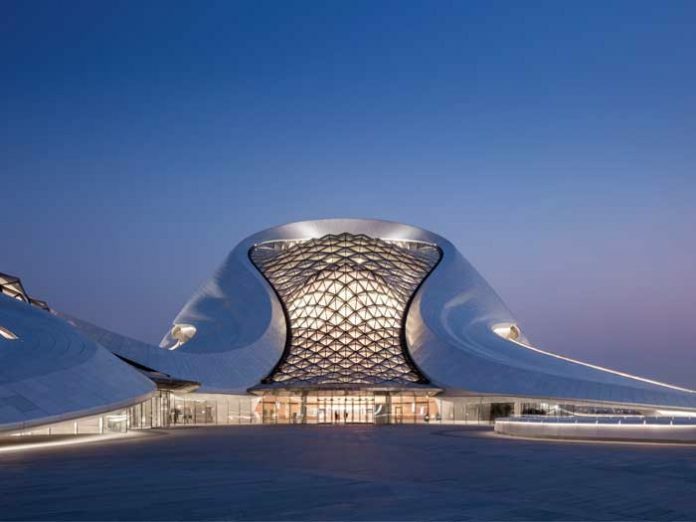 Known as the ‘Ice City’, Harbin, capital of Heilongjiang, China’s northernmost province, houses an expansive, impressive opera house. 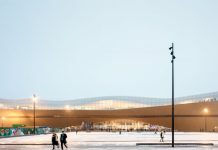 Set amongst the city’s untamed wilderness and frigid climate, the building boasts a crystal-like purity and transparency, blending in with the surrounding nature and topography. The lighting for this remarkable structure, managed by Beijing United Artists Lighting Design, was designed to complement the architectural concept that the building grows out from the local environment and responds to the aforementioned untamed wilderness, while also revealing the purity and clarity of the space, creating an enriching experience for visitors in the process. To help them work towards this concept, the lighting team devised a motto of ‘lighting the rhythm of the frozen music’. Working with the concept of revealing the purity and clarity of the space, the team at Beijing United Artists devised three ways of lighting the main atrium in one piece of roof, developing a hierarchy. From this hierarchical aspect, the designers made a careful lighting plan with a ‘less is more’ concept to be more adaptive to the functions of the varied spaces, and the movement of visitors. At the lobby entrance, a ‘welcome mat’ of light; in the middle, a super indirect light; and on the wooden shell at the end of the lobby, a vertical glow. All light fittings are completely hidden in the architecture, creating a pleasant rhythm of light unobstructed by technical details, and unplagued by hot spots or sharp corners. The wooden shell is the focal point of the lobby; washed lighting from above gives the whole lobby a warm, inviting atmosphere, while on the canopy outside, spotlights were placed in slots, directing light on the ground to avoid reflection and allow people inside to see out. To achieve the desired ‘purity’ in the space, it was important for the designers that guests see the light, but not the fixtures. The concept designer worked with a software expert and an industrial designer; together, this team calculated the illumination of each space, while making expert recommendations on where fixtures might be hidden. Through their efforts, visitors can explore the beauty of the space without awareness of any lighting fixtures. To create a twinkling effect on the pyramidal glass roof, the designer selected a quarter of each faceted unit, attaching it with dotted film. Sunlight adds a twinkle to each pyramidal unit, creating different glass reflections throughout the day. At night the filmed glass is grazed from below by LED light bars, seeming to glow from within and attracting visitor attention from far away. Within the smaller theatre, guests are reminded of the exterior of the building by a panoramic window behind the stage. This seamless connection to the outside world mimics the gleaming ripple effect of the lake outside. Narrow-beam in-ground features, carefully placed at the aisles along the walls, create the gleaming ripples of light on the walls. The irregular wall texture works with the light to create drama, rhythm and pleasing shadows. 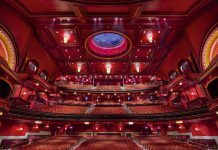 In the big theatre, the architect called for a glowing ‘diamond’ for the owner’s VIP area above the mezzanine. Custom RGB LED fixtures are hidden behind the acrylic diamond panel and transition from starry white to warm amber, changing according to the event or the seasons. This starry, twinkling diamond approach is replicated in the corridor connecting the basement parking plaza and the main lobby. Fibre optic lighting minimises the visual impact, but creates a dream-like grand entrance at the steps. In spite of this, Wang remains happy with the final outcome of the project, even if it was more demanding than other projects that he has been involved with. He said: “For me, I feel that it is the toughest project that I have ever worked on! I want to thank the architect, Ma Yansong from MAD architects, for his pursuit of perfection, as this encouraged us to create an equally perfect lighting solution. “Generally, we are very happy about the final effect. Whether looking at it from outside or inside, or moving from A to B inside, it presents most of our initial plans, in that we tried to create a hierarchical richness and a rhythmic mood to complement the music. 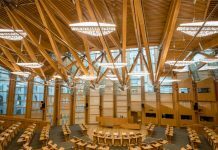 Wang added that while the award win was a great personal honour, he was hopeful that such recognition would have a knock-on effect for the Chinese lighting design profession as a whole. He said: “The award is a very important recognition for my more than fifteen years in lighting design. Along with my team, we were some of the very first lighting designers in China’s recent lighting history. Back when we started out, there were very few people or clients who would think of lighting design as an independent design discipline, let alone pay for our work. It took a lot of strength and belief from us to get through.